This course will examine the ethical issues that arose from the 1928 failure of the St. Francis Dam near Los Angeles, California. Near midnight on March 12 of that year the 195-feet high concrete arch dam collapsed catastrophically, releasing 12 billion gallons of flood waters downstream in a flood wave that reached a depth of 140 feet with average velocities estimated at 26 feet per second. By 5:30 AM on March 13 flood waters nearly two miles wide reached the Pacific Ocean near Ventura, California. The flood killed more than 450 people and was the worst civil engineering failure in U.S. history. In this course you will learn about the political and economic forces behind the project, the people who controlled the project, the ethical issues that were raised by the tragedy, and lessons the engineering profession learned from the tragedy. This course is intended for engineers, architects and other design and construction professionals wanting to learn about the ethical issues that were raised by the failure of the St. Francis Dam, and lessons that have been learned from the incident. Although this was a civil engineering incident, the ethical issues and lessons apply to all engineering disciplines. Learn about the history of the project and the economic and political issues that shaped its development. Learn about the dam’s relation to the controversial Los Angeles Aqueduct. Learn about the well known public agency manager who controlled the project. Learn about the indications of trouble that were inspected before the failure but ignored. Learn about the dam break flows and velocities that resulted from the collapse. Learn about soil conditions at the site that should have been investigated and accommodated in the design. Learn about the dam height increases during construction that were not properly accommodated in the design. 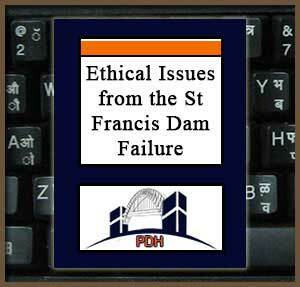 Learn about the ethical issues that were raised by the failure of the dam. Learn about the public agency manager’s engineering qualifications that raised ethical questions. Learn about the importance of professional training in avoiding similar incidents in the future.